Meet with the client. Meet there needs. We will usually recommend what grows well in South Florida and how fast and how it will accommodate the new planting areas. We will ask for your survey, take photos and ask for a small retainer to draft out a landscape plan which fits your budget...... which in turn is taken off the balance of the project. 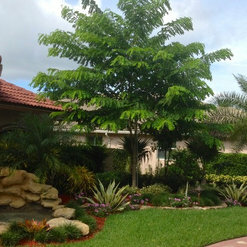 Bamboo landscaping is a family owned landscaping company located in the Ft. Lauderdale Florida. Studied art and design at the Ontario College of Art in Toronto, Canada. 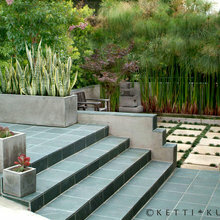 Whether you have a new construction or a desire to update an existing garden. We will sit down with you and seek out what your ideas are and give you our recommendations. 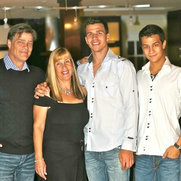 We employ a professional staff with over twenty five years of experience to assist you. 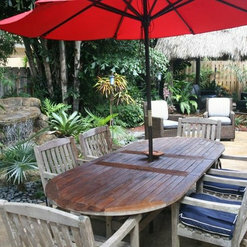 We provide outdoor living spaces, Waterfalls, Tiki Huts and Outdoor Kitchens. Customer satisfaction is our top priority. 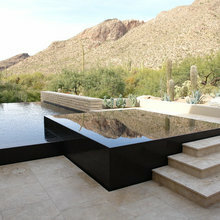 We pride ourselves on the personal attention paid to every client from design to final installation. Your project will be completed in a timely professional manner. We look forward to working with you. 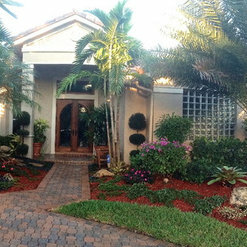 Mark, Did an excellent job designing and landscaping our yard. 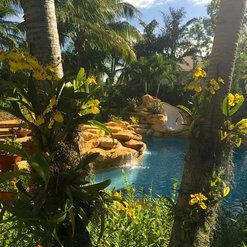 He truly transformed our yard into a tropical paradise. He and his staff helped us care for our newly planted trees after Hurricane Irma and ensured our plants look as well as they did prior to the hurricane. We would highly recommend Mark and his staff. My 1.5 acre yard was in sad shape, I had many gardeners and attempts at just fixing certain spots. I decided to do the yard right this time and allocated a budget. I had companies never show up, I had companies come take pictures promise a plan and never return. I saw Bamboo Gardens and liked what that looked like. Mark came right over and on faith, without drawings, telling him my budget in advance (all the wrong things) hired him to relandscape. My yard looks amazing - exactlythe zen look I wanted. His son Daniel is now doing my maintenance, and goes above and beyond. In addition when some of the plants died Mark came and replaced them, no issue. I couldn't be happier. 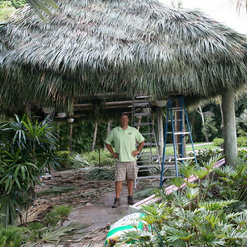 Bamboo Landscaping initially landscaped my pool area and built a fantastic Tiki hut. 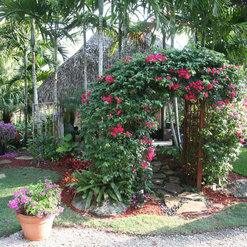 The owner has great design skills and the plants have all done well. Both pool landscaping and Tiki hut came out exceptional. Because of the great job his crew did, I had him re-landscape the front of the house. Prices for all projects were reasonable and his crews always showed up on time. The owner is very conscientious and personally checks on projects. Very satisfied with the landscaping. It is just what we wanted, look beautiful and the price was fair. They are also taking care of our garden and we are very happy. 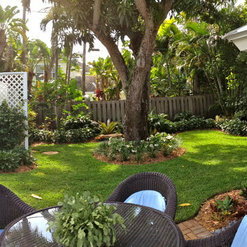 Mark and his team provided a gorgeous backyard landscape as well as a Tikihut that is the envy of the neighborhood. 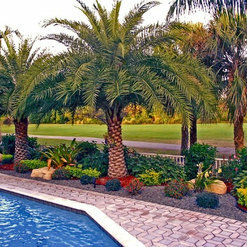 From start to finish, Bamboo Landscaping paid close attention to detail and made sure that the project was completed within budget. Bamboo designed the entire backyard overhaul as we went from a pile of dirt and grass to a full deck of travertine with stairs down to the dock /water. A first class job! Mark is very professional, meticulous and friendly. His strength is his artistic mind. Very good with layout of plants that would make the beds looked stunning. He has unique taste so finished landscape work is not the same old, same old. 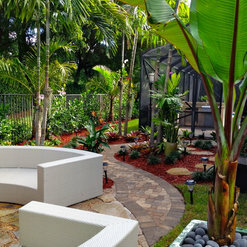 We have worked and known Bamboo Landscaping since 2007. Mark and his team created a unique design for our home. 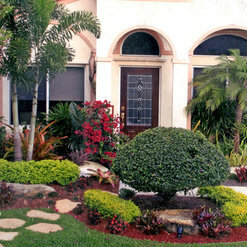 The quality of the work is excellent and the entire landscaping project really compliments our home. They recommended a ground lighting company which designed and installed uplighting and downlighting which looks great. Our neighbors are asking us "Who designed your landscaping?" We get many compliments. I highly recommend Bamboo Landscaping. 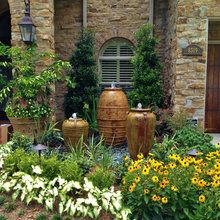 The owners and staff at Bamboo Landscaping are true professionals. After sharing my vision and budget for the landscaping at our home, I received detailed drawings, an itemized list and photographs of all the materials and unique plants that would be used. The project was completed well within the target dates, and no detail was left unattended to! They even graciously changed out a few things I wasn't happy with. My gardens are beautiful now! We couldn't be happier! Just wanted to say thank you for transforming our front entrance into something so beautiful! Anat is amazing, she listened to us and understood what we wanted, gave us suggestions and told me I would be happy. I'm certainly very happy. She's very honest, caring, follows through, stayed within our budget and has the best ideas. I will definitely call them again for our next project. Bamboo Landscaping provided outstanding service! Our backyard was in rough shape. We had drainage problems, issues with our palms, and so much more. Mark listened to what we liked about our backyard and incorporated it into our new and improved mini-sanctuary. Our yard is small, but now we have a path winding along beautiful plants that attract butterflies and that one would find at a tropical botanical garden rather than in your standard suburban yard. We are so happy with the results. The Bamboo Landscaping crew was professional and super-efficient. 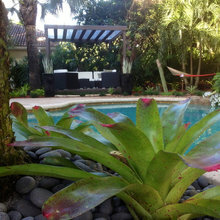 Mark really paid attention to detail, attaching bromeliads to our palms, complete with Spanish moss, fixed some edging that had become unsightly (free of charge), and even seperated out bromeliads from an overgrown pot. A french drain cured our drainage issues. I cannot wait till we hire them again for our next project. In the meantime, we have asked them to take over our garden maintenance as well. 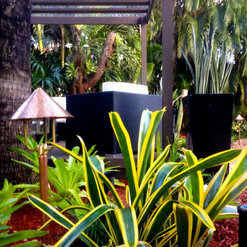 We appreciated how they tailored our garden make-over exactly to what we wanted and needed. We'd recommend them without hesitation. Mark and his team were so professional and helpful through-out the entire project. They did the design and implementation based on his design. They went above the job expectation! There's no other way to put it other than "WOW!" Anat was incredibly friendly, honest, professional and thorough. 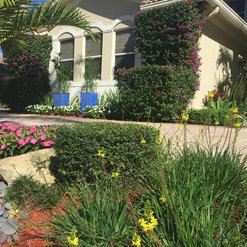 She took everything I said I wanted and needed into consideration and completely transformed the landscaping at my home to something beautiful. Her prices were very reasonable and she and her employees put a lot of time and effort into making sure my home looks perfect. I love pulling into my driveway now! Commented: love this idea for a hammockI usually nail tack it in. Sorry for the delay.